Businessmen and women know that there are some funny rules that apply to the business world sometimes. Often, business people scratch their heads and ask why we have to take certain actions. But local business women were deeply disturbed when they saw a closing Priscilla of Boston bridal salon destroying their unsold and, from what the onlookers can tell, perfectly good inventory. The video shows grungy men dressed like muggers on the inside of a dumpster taking pure bridal gowns and violating them with deep, blood red spray paint. Why did Priscilla of Boston (POB) destroy these beautiful dresses? One reason: keep the brand pure. David’s Bridal (DB), parent company of Priscilla of Boston, closed Priscilla’s doors to further invest in the 307 lower cost stores. Even though DB shut down POB, managers at DB don’t want any of their inventory ending up in some unsightly discount bin. This is unfortunate for brides on a budget, who could have benefit from the discounts. And DB has taken a lot of heat. Rightfully so! But are fearless brides who rock the frock, or trash the dress, to ruin a perfectly good gown any better than DB? I read the reasoning behind a trash the dress: closure for the wedding procedure, getting some cool pics, but let’s be real, people. You can get so much more use out of your beautiful gown. Be green in more way than one: resell your dress on websites like Recycled Bride, Once Wed, or Wore It Once. Make a donation: set up arrangements with a charity like Salvation Army to drop off or Donation Town to pick up the garment for resale. It warms your heart and your end of year tax returns. Make vintage-inspired bouquets to place all over your new home. Take the dress apart and make a teddy bear or a Christening or baby naming gown for your children. Making a few decorative pillow out of your gown, preserving the most unique aspects of the dress, to display prominently in your bedroom. Repurpose your dress as a holiday decoration, like a Christmas tree skirt. If your dress is made of the right fabric, you can make dinner napkins or a really cool table runner out of your gown. Bottom line is this: you shouldn’t make the same wasteful mistakes that David’s Bridal made. 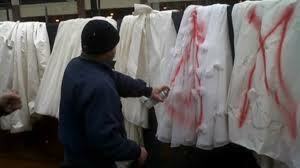 Don’t be one of those “muggers” who violated wedding gowns; do something useful with yours after your wedding. 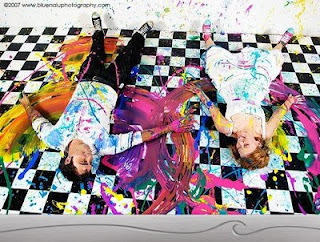 Did you trash the dress? Would you have done it differently? Share in the comments below.